A one-time registration fee of $25 per child is due to the office with the completed application packet. One week's non-refundable tuition is due prior to the child's first day. Two weeks' non-refundable tuition is due to hold an infant's spot. Parents/guardians must bring child for a minimum of one tour visit prior to enrollment. Parents pay weekly for a slot reserved for their child. Tuition is the same every week regardless of attendance. Tuition may be paid by cash, check, or credit/debit card. Changes to a child's schedule may be done via the office with 2 weeks advance notice. Any schedule changes must be approved by the Executive Director in order to be effective. Reduced tuition is available for families who qualify for the State of NH Child Care Scholarship. Income guidelines are below. For more information please contact our office. Parent/guardian must call the office if the student is going to be absent on a scheduled day. It is appreciated if advance notice of vacations and any other planned absences are given to the office via note or email. 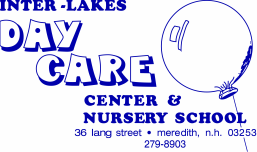 Specific information regarding illness and injury may be found in Inter-Lakes Day Care Center's Illness & Injury Policy. To prevent the spread of illness, all children must be fever-free WITHOUT medication for a minimum of 24 hours before the child will be allowed back at school.